Someday I went to my friends home long way from my house. I went to his house by train. The weather is very hot. So, when I'm in a train, I always clean my swept. 5 hours left, I arrived to my friends home with T-shirt full of wet swept. And then I take a bath and chat with my friend. Talking about what I do and what he does. He interest what I do in vector graphic, so he wants me to teach him how to. The next day, he is ready to learn vector graphic from me. I teach him step by step. Vector graphic just need one big thing, that is patient! I look my friend's doing. Then I smile. Because my friend is doing vectorize without patient, so I found messy outline every where. Then I tell him that he has to hold your breath to make more concentrate drawing each line. But he always doing fast without carefully. The left side is made by my friend and the right side is made by me. You can compare the result with or without patient. If you just think fast and done, you will not have a good result. For example is the left image made by my friend. Although it takes longer time than I do, but he's moving the mouse fast without patient. So, the nodes is messy. The faster playing pen tool (or bezier tool), the longer you get the result. The point is: Patient and careful makes sure! Now I realized that what I do right now is not everybody can do. Vectorize is not quite easy to do. Needs experience and one more time: patiently. I am grateful that God has provided this expertise. Thanks God. 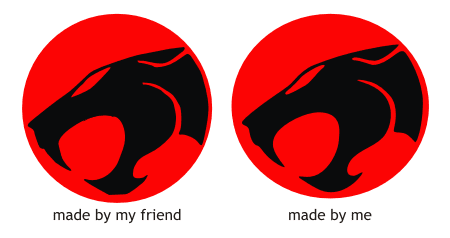 I will share my file (not my friend's file) Thundercat logo (cartoon serial 90s) in EPS file. You can download for free. Extract it first and open it using AI or Corel draw. Don't have corel draw yet? Just download it at right sidebar for personal use only. I just redraw it and change into vector..